Brave Filipino warrior Renerio Arizala -- the young Pinoy boxer who underwent brain surgery after a tough knockout loss last March 31 in Yokohama, Japan -- continues getting better and better day by day, a wonderful, blessed development that fills with hope and joy the hearts of his family, his friends and his fellow Filipinos, especially during these Holy Days of the Semana Santa. 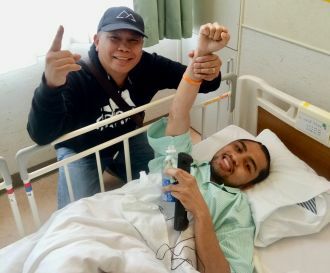 Today, veteran Filipino man of boxing Art Monis of Hardstone Boxing publishes on his Facebook page the touching photo of a smiley Renerio Arizala, 25, looking in high spirits in his hospital bed. "God is good all the time. Renerio Gemino Arizala mag pa galing pa ng mabuti malapit kanang makauwi ng Pilipinas at maka piling mo na rin ang iyong buong pamilya. Maraming Salamat sa lahat na nag dasal tumulong sa mabilisan nyang recovery. God bless us all..."
Thank you for that Art Monis. Indeed, God bless us all so let's all pray that good boy, strong boy Renerio will continue improving in his health and fast he will be totally back to normal and be reunited with his dear family, in Our Lord Jesus Name we Pray. The author Carlos Costa is a Panama boxing reporter living in the Philippines. Carlos can be reached at carlos512@hotmail.com and whatsapp/viber: 09184538152.